As a chef, I like to zero in on the most abundant natural resources at my fingertips, so in this issue, doing something different with striper seemed perfect. 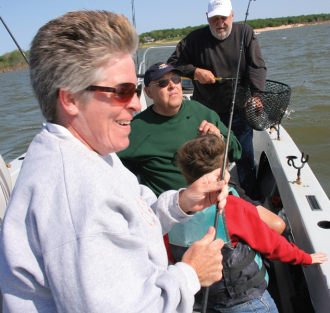 After all, Lake Texoma is famous for striper fishing—why not spend the day with a fishing pro? Leading striper fishing guide Gary Stewart taught me valuable techniques for preparing the centerpiece for our main food feature— striper tacos. I’m always learning as a chef, but this guy really enlightened me about capturing the best flavor of this most coveted fish, the striped bass. First and most important—Ice: To keep striper at its peak of freshness, never put your catch on a stringer and pull it around all day in the warm water. Once you reel in the big one, immediately put it on ice. Second—Remove the red meat: One reason people tend not to enjoy the striper taste is the red meat found in the middle of the fillet. Striper is a true white fish. White fish tend not to smell or taste “fishy.” Placing your hands on either side of the striper fillet and pulling the red meat out will leave you with a perfect fillet without the muddy lake taste. Third—Cold water boil: (It’s not really a boil; it’s just called that.) After the fillets have been cut and the red meat removed, placing the fillets in a bowl of cold water for final rinsing is a must. When the fillet is removed from between the skin and the bones of the striper, natural oil will form on top of the water the fillets are rinsed in. To remove the oil, hold the sprayer from your kitchen sink in the bottom of the bowl of cold water holding the fillets, and turn it on. This will create a churning (boiling), motion of the water. Keep this up until the water runs clear and all oil residues are gone. After following these three steps, then and only then will you have a perfect striper fillet. Good fishing and happy grilling this summer. Cher Ami was hit by German gunfire, but he made it through, arriving at his coop covered with blood and having lost an eye. His message received, the guns stopped the barrage, and the Lost Battalion was later relieved by American troops. The doctors patched the little bird up, even carved a tiny wooden leg to replace the one they had to amputate.